Allah Gobi works directly with Lord Buddha to assist all souls to achieve their Christ Consciousness within the Mastery Pathway. He offers you the essence of Peace, allowing each soul to fully embrace this essence within them. Allah Gobi encourages us to take the time, effort and energy to be still and silent to enable us to connect with our inner-selves and to acknowledge our inner light. He teaches us to still the mind, allowing us to access our Higher-Selves and the inner voice of wisdom. Allah Gobi reminds us that all that we need to know and all that we seek is within us. 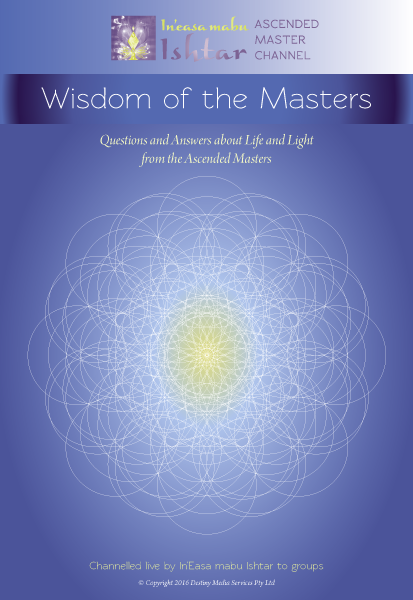 He encourages us to really know ourselves as this leads to empowerment on all levels, and opens us up to a wealth of inner wisdom and knowledge, as well as strengthens our connection to the Universal Energies. He encourages us to release and let go of things that no longer serve us that holds us back or weighs us down. Allah Gobi helps us to find what has true meaning in life and so we may discern what matters most. Allah Gobi helps you to attain and maintain a calm and balanced centre, regardless of external circumstances. He teaches you to attain inner calmness so that you are able to hear the wisdom of your Divine Self. It is said that Lord Ashtar is the leader of the Ashtar Command, a group of multi-dimensional beings from this galaxy that have come together under the banner of the Galactic Federation, which was created at the end of the Orion Wars. 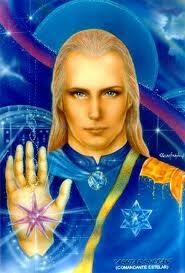 The Ashtar Command serves the light and offers to support and serve all manifested beings in the light. Lord Ashtar rarely comes to guide souls on the Earth personally, yet when he does he comes to remind them of the service they are here to give to the greater collective of souls known as humanity. He comes to ask them to put down their prejudices, their judgments and their resistance and to choose to shine their light instead with an open heart to support and hold the sacred space for all to grow and evolve to their highest potential. He asks them to do this in loving service and to let go all resistance to offering this gift from their heart and soul. Call on him when you need support and guidance to follow your path and unfold the mission of your soul in service to all beings. "I am one without form and life yet I am filled with the light. I walk the pathways of eternal light to my endless salvation and will walk beside you on your path of enlightenment. Step with me and seek the path of love for this is the way of the enlightened master. Let go your chains and limitations and be free of the veils of density and duality. In this you will become the light." Called the deathless avatar, Babaji is the immortal master of the Himalayas that was written about in the Autobiography of a Yogi. Said to be about 5000 years old, he is ever youthful and a great server of humanity. Babaji travels by thought and manifests anything needed from the air. He overcame physical limitations and ascended with his physical body and has promised to remain in his physical body on the Earth plane. Babaji assist those to come closer to God and to follow Divine Will. He encourages people to follow their own spiritual path. "I am the keeper of the wisdoms and hold the key to unlock the doorway to new unfoldments of mysteries. I will open your eyes and assist you to see more clearly the path upon which you tread. I will assist you to understand the Divine Heart and your connection in oneness to that which is within it. I am the light and the way." Master Djwahl Khul was taught by Kuthumi and was also one of the Tibetans fostered by Madame Blavatsky in the 19th century. His other incarnations included Confucious, a Tibetan lama in the Himalayas. In the 1900 he ascended in his 6th incarnation on the Earth realm. He works to balance energies and to make knowledge and wisdom accessible to all beings. He is also a Lord of Karma that sits on the Karmic Board. He comes to assist you to understand the use of your will, which is very powerful. He teaches you to understand the power of your will and to understand that the highest potential for you is to align your will to the will of your Divine Self. Because your will is strong this is not always so easy for you to do. El Moyra teaches you mastery of leadership through your personal power and in business or community. He helps you to understand right action and to know the importance of integrity in all that you think and do. His is always a mastery of service to the Divine and will assist you to focus on the path ahead and not to be distracted so you may manifest your life purpose. He assists you to open your consciousness to connect with all souls around you and all life – the trees, nature, plants and animals. He assists you to understand that we are all one and the Universe is unlimited Source of energy for all. He shows you how you are interconnected with all things. He assists you to open to the collective consciousness of humanity where you are no longer an individual but recognize the group consciousness. In other words, he brings you out of separation. He teaches you to use your unlimited mental powers to have an open mind that is ready to receive new ideas. He works to help you expand your mind and bring new consciousness and spirituality into all areas of your life. He takes you on a journey of discovery so you can embrace the new. Hilarion is connected to the Temple of Truth and is one of the Keepers of the Universal Laws. He represents the highest galactic confederation of our solar system in Saturn. His service to humanity is to assist the dawning of the New Age of consciousness for humanity. It is said he was Paul the apostle in a previous incarnation on the Earth. He works with Archangel Raphael. This Master is the physical incarnation of the prophet often called Jesus Christ, His mastery is to assist all souls how to live on the Earth as the sacred vessel of their divine spirit and he shows you how to honour this truth in yourself and in all beings. He brings discipline and mastery to the physical self, teaching you how to live in a physical body yet remembering the divine spirit that you are. He asks you to honor the light of spirit in yourself and in all beings and to seek your higher potential on the Earth and to let go of your attachment to duality. His teachings show humanity how to open their hearts and minds to all that is and to release all separation through judgment and limitation. If he steps to you it is to show you how to improve the way you live in the physical world and to remember you are the sacred vessel of your divine spirit and to live this as your truth. "I come to assist those on the higher path of Light to focus on that which they are and to keep the flame alive and burning brightly within them. There is nought to do but to focus and be disciplined in what one wishes within one's heart. To see the path of God and to follow this golden light all the way unto the end. This does not seem so hard, but many find it intolerable. I am the one that comes to hold you firm and to teach you the nuances of Light." Kuthumi is the cosmic teacher and assists all seekers who wish for knowledge, not for its own sake, but for the good of all. His last incarnation was as a Punjabi in India in the 19th century, Sirdar Thakar Singh Sadanwali. He attended Oxford University in 1850 and spent time in Germany. His remaining years were spent in Shigatse, Tibet, where he sent letters to students that are now in the British Museum. Originator of the Theosophical Society Madame Blavatsky met Singh in India and promoted his teachings along with others in North America. 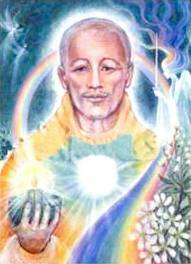 Master Kuthumi was formerly Chohan of the 2nd ray of Divine Illumination but now serves with Jesus as a world teacher. Kuthumi is the master that will teach you the divine truth of love and wisdom and how that may manifest and flow in your life. He shows the student that it is important to open to receive love as well as to give it in service, and assists you to open to love yourself so that you may truly offer love to others from your heart. He also offers God’s truth that all your experiences bring you wisdom as you learn to open through your love to see the wisdom in every experience that you encounter on the Earth. It is said that Kuthumi is a member of the Brotherhood of Golden Robe, those who take on the pain of the world. His ashram sits high above Kashmir in India and he also has an etheric retreat at Machu Picchu. In past incarnations it is said that he held the personalities of Pythagoras, bringing in sacred geometry and the music of the spheres; the wise man, Balthazar; Shah Jahan and St Francis of Assisi. He works with Archangel Jophiel, and oversouls the vibrations, wisdom, illumination, foresight, consideration and friendliness. He works particularly with teachers, students, architects, ambassadors and artistic, creative people. Kuthumi always comes to seekers of knowledge when they call to him. Call to Kuthumi when you truly wish to walk the spiritual path and open to your love and wisdom. He will show you the process through his wisdom to living a life filled with an open heart. He will always assist you if you call and if you have chosen a path to assist others Kuthumi will walk beside you to assist you. Lord Lanto is a master of the power of precipitation—the alchemical process of drawing forth cosmic light and substance from the universe and coalescing it into physical form, often by using the Science of the Spoken Word. He is concerned with the guidance of your spiritual destiny, helping you to recognize God and achieve soul freedom, whatever your path and beliefs. He is dedicated to the evolution of this planet through Cosmic Christ illumination. The golden flame that he bears is charged with the momentum of God-victory for the youth of the world. Lanto wants all of us to recognize our Inner Light and believe in our own Divinity. When we are able to recognise that each one of us is an emanation of God, that we all are in truth never separated from Him and that we are all One, we will see that the path we choose to take Home is not relevant, but how we tread that path is. Lanto works especially with the crown chakra and will help us open to receive words of wisdom and knowledge and gain an inner knowing of when we hear truths. Gaining knowledge also helps us expand our boundaries and our perceptions and makes us receptive to new concepts, thoughts and ideas. "I am of the realms of the highest and sit on the right hand of God/Goddess. I bring to you the light of all that is to assuage your souls and spirit and to assist you to be that which you are. I am the Lord of Discipline and the Lord most high. I bring to you the frequencies of the God essence that which you are. Lift yourselves beloveds and be one with the light." In the Dead Sea Scrolls he is called Michael and some allude to him as being one with Jesus and Archangel Michael. According to The Book of Enoch Mechizedek was the child of Noah's brother, Nir and others say he was Noah's son Shem. The Cosmic Priesthood or Order of Melchizedek is described in psalms and holds ancient esoteric teachings. "The Lords of Light await you to lift you up and hold you firm upon your path. Do not let your head drop to the pavement and walk unattended beloved ones. Be one with us and follow the Light for it is always your path home." Maitreya is head of the spiritual hierarchy and is thought to be an aspect of Jesus and Sananda. In Buddhism Maitreya is the future Buddha who will be reborn in a period of decline to renew the doctrine of Buddha. It is said he is a bodhisattva, one who has refused entry to Nirvana through his desire to help others. His following first began in India around the 3rd century then spread to China, Korea and Japan. Scholars believe he was a monk named Sthiramati who showed compassion and kindness to others, although others call him Hotei, a T'ang Dynasty monk known for giving candy to children. It has been prophesised that 4-5,000 years after Buddha left his physical body Maitreya will reappear on the Earth in human form. Call to Maitreya when you wish to hold enlightenment in your heart and mind. "Beloved ones of the Earth realms harken to that which I say to you at this time. Let go your resistance to the Light of God, be that which you are and transcend the illusionary realms of where you sit. Look skyward and be with me in bliss and infinity. Transmute the darkness to be one with the light. It is time." Saint Germain was channelled by Madame Blavatsky in the late 19th century and was known as one of the "Tibetans" a group of three masters - Djwahl Khul and Kuthumi - that lived in Tibet and physically incarnated in the Himalayas. It was said they could materialise anywhere before your eyes. Saint Germain also ruled over a kingdom about 50,000 years ago where the Sahara Desert now sits. It was filled with great peace, happiness and prosperity and most inhabitants retained full connection with the wisdom and power of God. Saint Germain is a master of the ancient wisdom and knowledge of the matter of spheres. He ruled by Light and was the embodiment of the archetype of universal Christhood. His is renown for his alchemy, elixirs of youth, inventions and gifts of love, light and life. He was also the high Priest of the Violet Flame Temple in Atlantis 13,000 years ago. It is also said Saint Germain incarnated as the following personalities on the Earth: Francis Bacon; one of the kings of Atlantis; Samuel the Prophet; Alban, a Roman soldier; Merlin; Roger Bacon; and Christopher Columbus. In his last incarnation he was known as the Count Saint Germain, called the "Wonder Man of Europe" in the 1700's. It is said he e looked the same for 100 years, spoke every language, travelled by thought, fed the poor, and worked for peace. He took his body into light (ascended), and now works in service to humanity from the lighter realms. Saint Germain extolled and exemplified freedom of the mind and spirit and teaches us to espouse our inalienable divine right to live life according to our highest conception of God. He is also a Lord of Karma that sits on the Karmic Board. It is also claimed that Saint Germain is the sponsor of the United States of America. It is said that Saint Germain stood by George Washington throughout the Revolution and during the winter at Valley Forge. His past efforts in initiating the society of Freemasons inspired many of the key figures of the American Revolution. General Washington, Alexander Hamilton, James Madison, John Hancock, Benjamin Franklin and as many as fifty-three out of the fifty-six signers of the Declaration of Independence were all members of the Masonic order, whose principles had guided them in founding the new nation. Further, it is said that Saint Germain called for the signing of the Declaration of Independence, directed the writing of the Constitution and anointed Washington first President of the United States. Saint Germain is the supreme alchemist and teaches that the highest alchemy is the transformation of human consciousness into the divinity of the Higher Self. He stands ready to assist all souls in this endeavour. 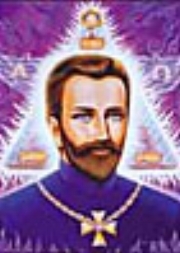 He has also said through channelled information that he would release the technology of the Aquarian age when the nations had put behind them the destructive uses of science and religion and enters his heart and the nucleus of the atom to harness from both the unlimited spiritual and physical resources to establish the golden age. He oversouls the age of Aquarius and offers the gift of the violet flame to assist transmutation and transformation of all energy – from pure light to pure light. He tutors and initiates souls in their mastery, preparing them to receive the Holy Spirit’s gifts of prophecy and the working of miracles. Saint Germain offers the potent power of the violet flame to transform the vibration of all energy that holds you in limitation – your fears, old beliefs and karma. He assists you to let go your old attachments and to embrace the new energy that will liberate you. Call to Saint Germain when you are challenged, in limitation, in resistance, unable to see the divine truth, feeling trapped, when the ego leads you into power struggles and when your fear urges you to try to control everything. Metatron is mentioned in Judaism and also Christianity. He is known as the angel of life. He guards the Tree of Life and writes down the records of what people do on Earth, as well as what happens in heaven, in the Book of Life (which is also known as the akashic record). Metatron is traditionally considered have been a human on Earth before ascending to heaven as an angel. Metatron is said to have lived as the prophet Enoch. People sometimes ask for Metatron's help to discover their personal spiritual power and learn how to use it to bring glory to God and make the world a better place. Paul the Venetian is the master that oversouls the sacred arts on the Earth and assists all souls to discover the potential of their creativity as Master Co-Creators on the Earth, whether they are creating and manifesting themselves, their spiritual self, a higher self or sacred projects. He assists all souls to learn how to express themselves through their creative natures. It is said that Paul the Venetian incarnated in the following personalities on the Earth: Paolo Veronese (Paolo Caliari) 1528-1588, Italian Master Renaissance painter, who was a spiritual and artistic revolutionary who saw beauty as the most powerful catalyst for enlightenment; an Egyptian master of esoteric architecture who worked with El Moyra at the time of the building of the pyramids; an artist in the Incan empire who used paints that did not fade; head of cultural affairs in the government of Atlantis who, before the sinking of Atlantis, established a Focus of the Liberty Flame in Peru - which gave an impetus to the culture, beauty, and wealth of the Incan civilization. His focus is to initiate and balance of the heart chakra through beauty and art. It is also said he ascended on April 19, 1588 from the Chateau de Liberte in southern France after his passing at the age of sixty. Call on Paul the Venetian when you wish to express your creativity, become an artist in some form, and be your true creator self in alignment with your Divine Presence. "I am the leader of the path of Ascension and it is through me as the gateway that you will take your initiations in light and love to discover the true path and that which you are. Call to me to assist you along the path to bring forth the illuminations of each doorway and to hold it wide open for you to step through when you are ready. In the meantime, I will be the whisper in your ear to remind you of that which you are." Master of Sacred Mystery Schools in all realms. It is Serapis Bey that holds, the ascension door open in the etheric realms in Luxor, Egypt. He was the Egyptian Pharaoh Amenhotep III in 1417-1379BC, called the magnificent, bringing Egypt to the height of diplomatic prestige, prosperity and peace. He constructed the temple of Luxor. He also embodied as Leonidas, King of Sparta in around 480BC. He was a high priest in the Ascension Temple in Atlantis more than 11,500 years ago. He also worked with Madame Blavatsky founder of the Theosophical Society in the 19th century. It is said he ascended in 400BC. A loving master Serapis assists to bring peace to the Earth and avert war and loves nothing better than to coach people demanding lovingly that we see the light within us. He is interested in the physical body and offers advice on caring for your physical wellbeing as well as your spiritual wellbeing. He is also a Lord of Karma that sits on the Karmic Board. Serapis Bay assists all souls who wish to open to the greater mystery of life and to expand this within their own heart. He offers a deep connection to the mystery of God consciousness that is found in each one of us and assists you to embrace the unknown mystery of life as it unfolds. It is said that Serapis Bey originally came from Venus and is the Keeper of the White flame and he works with Archangel Chamuel on the ray of compassion and is the only Ascended Master who works with the Seraphim. It is also said he incarnated as the Pharaohs Akhenaton V and Amenophis. Serapis Bey is the master of Divine Truth and is often very direct and straightforward. He touches the very core of any matter and can see past all that filters the Divine Truth. Call on Serapis Bey when you wish to begin to train on the inner planes and work deeply with spirit and when you wish assistance to connect more deeply with your higher self consciousness. Call to him when you truly wish to embrace the mystery of God in your life. Call on him when you need to know Divine Truth and cannot see past your old stories to the core of any matter. Sanat Kumara is an "advanced being" at the ninth level of initiation who is regarded as the Lord or Regent of Earth and the head of the Spiritual Hierarchy of Earth who dwells in Shamballah , a city said by Theosophists and those adherent to the Ascended Master Teachings to be a floating city on the etheric plane above the Gobi Desert . It is believed that he is the founder of the Great White Brotherhood, which is composed of Masters of the Ancient Wisdom called in the Ascended Master Teachings and volunteers from other worlds who have joined together to advance spiritual evolution on Earth. A shrine to Sanat Kumar which attracts and unites people of all religions and faiths is situated in the town of Kataragama , Sri Lanka. In Sanskrit Sanat means "eternal", Kumara means a "youth", which would make Sanat Kumar the "eternal youth" in Sanskrit. It is believed that Sanat Kumara came from Venus to the Earth around 18, 500, 000 years ago with the Lords of Flame, which included many of our world teachers, and they set up a colony on the Earth. The beings living on the etheric plane of Venus are said to be hundreds of millions of years ahead of us in their spiritual evolution. It is said that the governing council of Venus one of themselves, Sanat Kumara, here to guide us. Call on Sanat Kumara when you need to see your own light and beauty and embrace this as your truth. 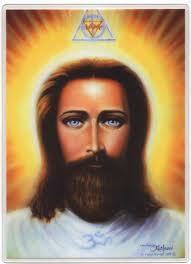 Sananda is the higher self of the personality on the Earth known as Jeshua of Nazareth. He is the spiritual mentor of humanity and assists our spiritual growth and guides us to the alignment of our souls' highest spiritual evolution. Sananda reminds us of our Christed (God) natures and how this vibration of energy lives in the heart of each one of us. 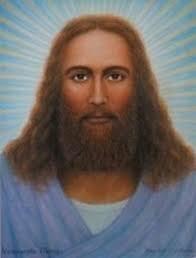 Sananda holds the Christed light and comes to activate it within you that you may remember your true nature and activate this into your reality on the Earth. He calls to humanity to come into the acceptance of their God nature to embrace the state of unconditional love that is held deeply I the core of their consciousness. The consciousness of Sananda is available to each of us at all times, and when we choose to open our hearts to receive his unconditional love he guides us from to embrace self-loving choices and actions in our daily lives and improve our understanding and practice of the state of Unconditional Love. As the prophet Jeshua on the Earth, Sananda showed humanity how death can be overcome and that love, forgiveness and compassion are our true nature. "What I have done you can do and more". Like all great masters Jeshua came to teach humanity how to embody our Christed (godlike) nature on the Earth. Call to Sananda when you wish to step from your ego mind and embrace your Divine Nature as your truth and to live each day held in the state of unconditional love. Call to him when you need assistance to love yourself and to accept the Divine in all beings. It is said Vywamus is the higher self of Sanat Kumara and is a very high frequency Universal being who holds profound wisdom. It is reported that he lived 32 lives in the physical existence in another galaxy. He is an expert in communication and focuses on the energy of joy, laughter and self-love. He comes to assist you to evolve and lift your mind to a higher consciousness. He works to assist humanity at a mass consciousness level to raise its vibration to prepare for the ascension process on the Earth. He focuses on the Ascension of the Earth and the need for humanity to evolve so this may occur. To do this he says it is imperative that you choose to raise the amount of light and love in your cellular structure and to open to receive this from the heart of Source.